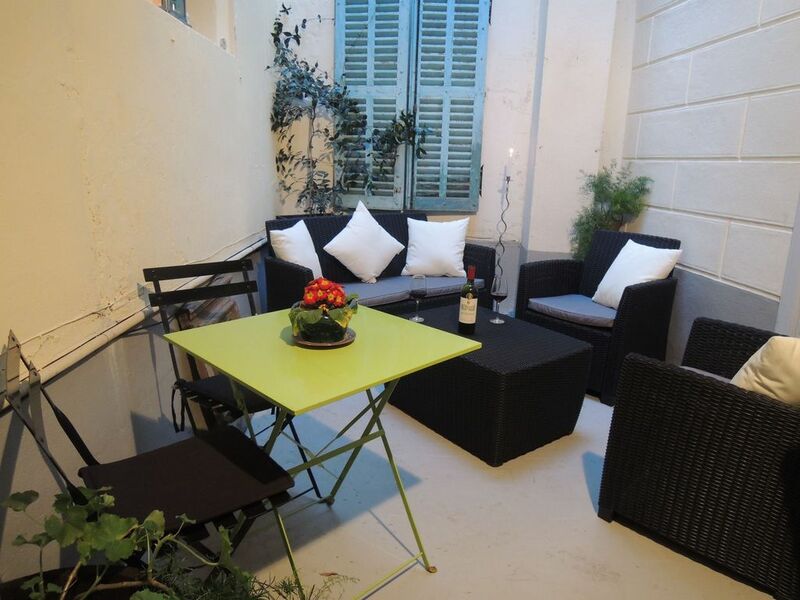 Set in a beautiful old townhouse, “L’Appartement Cour” is light, airy and attractive. This spacious, 60 sq m apartment has all modern facilities yet retains many of the original features of the old building. The apartment overlooks Rue des Augustins which has shops and boulangeries and the main square can be seen by leaning out of the window! Limoux is a lively town but modern double glazing ensures that street sounds are kept to a minimum and, for those who like to have fresh air circulating, the double doors at the back of the apartment (which open onto the secure, inner courtyard) provide the perfect solution of allowing the coolest air in during the summer with minimal accompanying noise. The apartment has one bedroom with a double bed (100% cotton sheets and feather duvet by default but other bedding options are available), wardrobe and dressing table, a large open plan living/dining room area, a separate bathroom (refurbished 2015) with shower and a fully-equipped kitchen leading to the apartment’s own pretty inner cour (courtyard) with table with chairs and barbecue facilities – the perfect haven after a hard days sight seeing, wine tasting or just relaxing by the river. L’Appartement Cour is on the 1st floor (up one flight of stairs) and is comfortable for both summer and winter use. - Recently refurbished shower room with basin and toilet – modern plumbing and endless hot water! - ‘Starter’ supplies of tea, coffee, bottled water and basic toiletries are provided – if you require a pre-arrival grocery shopping service, eg to provide your first evening meal and/or breakfast then please enquire. - A clothes washing service is available at 5€ per load. (an iron and small ironing board are provided in the apartment) There is also a coin wash close by. - Free parking is available close to the apartment (reservation not possible) or airport transfers can be arranged – please enquire. - Cyclists: as long as you’re willing to carry your bicycles up one flight of stairs they can be cleaned and stored securely in the cour. Our aim is to help make your stay as pleasant and enjoyable as possible so if you need anything else please just ask! Recently migrated to the South of France from Yorkshire, England. Both places are beautiful but Limoux already owns my heart. Come visit and you'll see why! A beautiful property in a great town in a lovely part of the world, what more could you wish for? We fell in love with and bought the entire apartment which in fact comprises three residential floors, from the building's shared entrance hall our private staircase leads first to the door of our gorgeous holiday accommodation (there's a ladies clothes shop at ground level) then we live above on the two remaining floors. The 1st floor apartment's garden courtyard! It's a tranquil space for your own personal use and an unusual and fascinating architectural feature. toilet, shower, Heated electric towel rail. Towels and toiletries provided. Bathroom with endless hot water, heated electric towel rail and plenty of towels provided. Central heating in the living room/dining room and kitchen. Electric towel rail in the bathroom and an electric radiator in the bedroom. 100% cotton, linen change provided weekly for stays of longer than a week. Sorry not in the apartment but a washing service can be provided (fee applies) or you can use one of the local launderettes. Sorry not in the apartment but a drying service can be provided (fee applies) or you can use one of the local launderettes. Public parking is available close to the apartment, free of charge (reservation not possible). Towel changes provided twice-weekly for stays of longer than a week. With two large comfortable sofas, a large flat-screen television, DVD player with a selection of DVDs, books, games and tourist information. Sorry no freezer compartment, but we can provide ice and freeze ice blocks (eg for the cool-box) for you during your stay. Gas hob running on mains gas. Gas oven running on mains gas. Tea, coffee, oil, vinegar, salt pepper, herbs and spices. Plenty, including pots, pans, oven trays, jugs, vases, hors d'oeuvres plates and picnic items. There is also a small, bistro-style dining table in the courtyard. Cet appartement est idéalement situé à côté de la place la plus animée du village. Il est vaste et très agréablement décoré et dispose d'un patio permettant de s'installer dehors en toute tranquillité. L'accueil d'Helen est chaleureux. Merci pour ce très agréable séjour. Limoux is a vibrant market town of around 10,000 inhabitants. The heart of the town is 'la Place de la République', a wide and archetypal French square with some fine stone arcading, a number of timber framed houses and full of bars, restaurants and shops. The architecture is medieval and the narrow roads of the old town wind through the inside of some of the original fortified walls of the town. Limoux itself straddles the River Aude with its excellent picnic spots and the banks are lined with grand houses, especially on the eastern side, the so-called Petite Ville or Spanish quarter. Limoux likes to party in a most unselfconscious way and for its own pleasure rather than out of any sense of obligation to entertain the tourists (however everyone's welcome to join the fun and most events are free of charge). A very musical town, there are concerts and dances on a regular basis as well as markets, fireworks and fetes throughout the year, however Limoux is perhaps best known for its winter festival, the 'Carnaval de Limoux', which is one of the oldest and the longest in France running from January through to March. No description of Limoux would be complete without a mention of its excellent wine, which falls under four (AOC) designations: Blanquette de Limoux, Blanquette Méthode Ancestrale, Crémant de Limoux and Limoux, the first three of which are sparkling wines and the fourth is particularly well-known for its excellent Chardonnays. Wine historians believe that the world's first sparkling wine was produced in this region in 1531, by the monks at the abbey in Saint Hilaire. Every bar will serve you the local fizz, priced from just €2 per glass, and on busy nights the town resounds with celebratory sound of popping corks. Limoux is also an excellent base for discovering the history of the region and is ideally placed for exploring the coast, the mountains and some of the finest walking and cycling country in France. The Canal du Midi and the World Heritage site of Carcassonne are both visited all year round and readily accessible from Limoux on the single track railway with regular trains to Carcassonne for only €1, or further into the mountains stopping at villages on the route for the same price, bikes travel free. Please feel free to contact us for more information about things to do or to make advance reservations for any activities you wish to undertake during your stay. Taxe de sejour of €0.60 per person per night is included in the total price. An extra €10 per night is chargeable if the camp bed is required.